Nearly 25% of U.S. adults suffer from a diagnosable psychological or mental disorder in any given year. It is estimated that the number of physician visits during which a medication for an emotional or psychiatric condition were prescribed increased from about 11 million in 1988 to 20 million in 1994. Most of the medications prescribed were to treat depression and anxiety disorders, and in any given year about 10% of all medications prescribed are for psychological problems. Although we have made great strides in the treatment of emotional and psychological disorders, too many of us still suffer terribly and this indicates that we must find another, more effective way to manage the distress and purposelessness that marks most of our lives. The pain, despair, and instability that characterize many of our lives became our destiny when Adam and Eve defied the Lord and ate of the forbidden fruit. Jesus is often considered “the new Adam” because, like Adam, Satan tempted him, especially during His 40 day fast in the desert. Unlike Adam, however, Jesus was tempted but did not sin. We were meant to live in peace and harmony with God and with each other, not to experience the distressing emotions and feelings of insignificance and meaninglessness that plague our lives. Moral relativism, also sometimes called postmodernism, is a philosophy that says there are no objective moral standards to determine what is right or wrong that transcend culture or the individual. 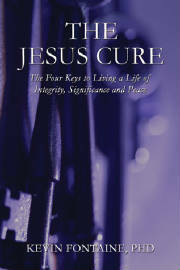 Jesus’ life and example is the cure for the disease of moral relativism that plagues our times.